The ENA Foundation State Challenge kicked off on January 24th at the Leadership Orientation in Chicago and continues until May 31st. California ENA pledged to raise $5000. Currently $76,886.31 has been raised nationally towards ENAF’s $190,000 goal. Thanks to San Francisco ENA , Sacramento ENA and Diane Schertz for the prizes donated for today’s Opportunity Drawing which raised $1257. Members can register on smile.amazon.com to contribute 0.5% of eligible purchases to the ENA Foundation. Academic scholarship applications are being accepted March 1-April 28, 2019. EN 2019 conference scholarships are being accepted February 11-March 29, 2019. Please visit the ENAF website for details and to apply. Cal ENA has the opportunity to name a second scholarship from the 2018 State Challenge. To honor all those affected by the multiple disasters that California has experienced , it was decided to name the California Disasters Memorial Scholarship. The ENA Foundation State Challenge Campaign had a goal to raise $130,000. California’s $9,223 helped raise the final total of $222,724. The largest percentage increase per capital award went to Oregon State Council. New Jersey State Council won the largest number of individual donations per state award. Texas State Council made the largest donation of $44,135. There will be multiple opportunities to donate to the ENAF at Emergency Nursing 2018 in Pittsburgh through Opportunity Drawings and purchasing VIP access for the Welcome Party. There is also still time to buy bricks for the Pave the Way to Your Legacy at the new ENA Headquarters Building. This may be done online or by contacting ENAF @ 847-460-4100. 4″x8″ bricks are $250 and 8″x8″ bricks are $500. Thank you to the East Bay and Mid-Valley Chapters, Julie Rossi and the Leadership in Practice Committee, Judy Scott and the EMS Committee, Kara Davis, Patrice Christenson, Louise Hummel and Diane Schertz for the donation of prizes for today’s Opportunity Drawing which raised $785 for the Judith C. Kelleher Endowed Scholarship. November’s fundraising will be for the 911 Scholarship Endowment. Your unwavering support is so greatly appreciated! The Cal ENA Board of directors requested that each chapter donate a dollar for every member of the chapter in support of the ENAF State Challenge campaign which has been extended to June 30th. The Board is purchasing bricks in recognition of Judy Kelleher, ENA Co-founder and the California State Council in support of the ENAF State Challenge. Thanks for the donation of prizes for today’s Opportunity Drawing from Inland Empire Chapter, Loma Prieta Chapter, Julie Rossi/Leadership in Practice Committee, Mindy Elayda/San Francisco Chapter and Diane Schertz which raised $385. Prizes for August Opportunity Drawing in Sonoma will be provided by Superior and San Diego Chapters. Funds raised will go to the Endowment of Judith C Kelleher Scholarship. The Board has assigned Chapters to specific State Council Meetings to provide gifts for the Opportunity Drawings in 2018. Thanks to Orange Coast Chapter, EMS Committee, Leadership in Practice Committee and the ENAF Fundrai$ing Committee for the Opportunity Drawing prizes at the Laguna Beach meeting. Thanks to all who contributed to raise $441 towards our State Challenge Donation for ENAF. We had a two day opportunity to raise money for the 911 Endowment Fund in November with the ENA by the BAY education event on the 16th and the State Council meeting on the 17th. The opportunity drawing on the 16th had great prizes including 2 night stay at the Double Eagle Resort and Spa, latest edition of ENA’s Core Curriculum( edited by California’s very own Vicki Sweet), a Power Air Fryer Oven (in honor of 2017 Year of the Healthy Nurse) and lots of “fire” with a Kindle Fire and a Firefly Crystal Bracelet netting $445. But the great State Council was not to be outdone raising an additional $540 on the 17th. The generosity of the nurses in California never ceases to amaze. That being said…the challenge is on for 2018 State Challenge Fundraising event which commences in Feb and ends May 31st. The State Councils of Texas and California are “locking horns” to see which state can raise the most money and the loser must serenade the winner at the Annual meeting in Pittsburgh. Our talents not withstanding-I think we would rather be sung to than sing! So please spread the word to your colleagues and let’s show them some “gold” from the Golden State. Huge thanks to the many individuals and groups who donated prizes for the November events, State Council Board and Committee Chairs, Chapters-especially San Diego and Orange Coast, David Samuelson, Janet Williams, Kathy Van Dusen, Dianne Idman-Gervais and Diane Schertz and apologies to anyone I forgot. (I blame it on the Alzheimer’s :>). Cal ENA pledged $5000 to the ENA Foundation at the kick off for the State Challenge at the State Leaders Meeting in Las Vegas in February which runs until May 31st. Chapters made pledges to the State Challenge. Thanks to the Government Affairs Committee, EMS Committee, Sacramento Chapter, Kara Davis and Diane Schertz for the multiple prizes for the March State Council meeting’s Opportunity Drawing. Cal ENA-Tee it Up for Scholarships Campaign was kicked off by playing the putting green and raised $1120 by the generous attendees at the State Council Meeting. THANK YOU ALL. 2016 State Challenge raised $129,070 to fund 2017 scholarships. This was 103% of the goal. California was a big part of this and it is greatly appreciated. Academic scholarship application electronic portals open March 1, 2017. Submission deadline is April 28, 2017.Recipients will be notified on August 1, 2017. For more information about available scholarships, visit ENA.org. STTI/ENA Foundation. Research Grant deadline is March 1, 2017 and recipients will be notified in June. Scholarships for ENA Annual Conference registration will be offered again in 2017. More information on this to follow later this year. State Challenge beings Feb 1, 2017. The 2017 campaign will kick off at the opening party of the Leadership Orientation in Las Vegas. The theme this year is “Tee It Up for Scholarships” in honor of the inaugural golf classic to be held in St Louis in September in conjunction with ENA 2017. The State Challenge ends May 31st so anyone planning to donate to the ENA Foundation is encouraged to donate during this event to help California State Council win the challenge. January’s State Council meeting Opportunity Drawing raised $345 for the State Challenge. Thank you to the East Bay Chapter and Judy Scott & the EMS Committee for the donation of prizes. 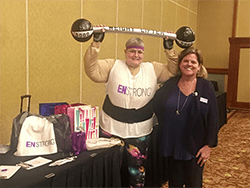 A Huge THANK YOU to Diane Idman-Gervais and the Education Committee for an excellent education conference this November, and especially for organizing the awesome Opportunity Drawing which raised $825. Special thanks to the following individuals/groups for the donation of the prizes: Kathy Van Dusen – A 2-Night Stay at the Double Eagle Resort; Marty Hay – a gorgeous handmade quilt; National ENA for 2 annual memberships; Cal ENA Education Committee – 2 EN 2017 conference registrations and Diane Schertz- the framed California laser cut print. Thanks to the San Diego Chapter and Janet Williams for the donation of gifts for the November State Council meeting Opportunity Drawing which raised another $390. The total going to the ENA Foundation 911 Endowment Fund from these two event is $1215. Awesome! Your generosity is overwhelming and greatly appreciated.